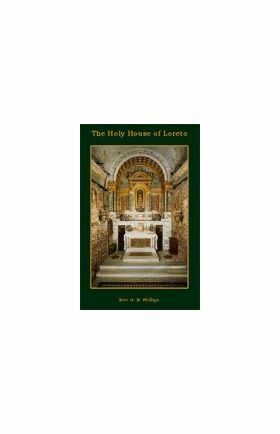 This history of the Holy House of Loreto is the most decisive work in English defending the authenticity of this most hallowed shrine in all Christendom. Our Lady’s Holy House at Nazareth was taken by angels to Dalmatia (Croatia) in 1291 to prevent its desecration by the infidels. Three years later it took flight again to rest in Loreto, Italy, where it remains. Rev. Phillips provides the facts, and excitement behind the story. 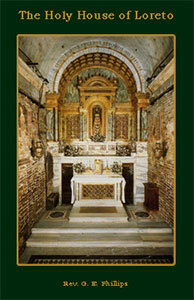 Many cures, apparitions, and miraculous conversions, have happened within the limestone walls of the Santa Casa. We know not how better to open the subject of the following pages than by setting before the reader the following extracts from two letters of Cardinal Newman, which were addressed by him in January of 1848, to Henry Wilberforce, immediately after his own return from Rome, where he had been ordained priest, and had become an Oratorian. “What took us to Bologna,” wrote the future Cardinal, “was that we went round by Loreto. We went there to get the Blessed Virgin’s blessing on us. I have ever been under her shadow, if I may say it. My college was St. Mary’s and my church; and when I went to Littlemore, there, by my own previous disposition, our Blessed Lady was waiting for me. . . . Such, then, was Cardinal Newman’s attitude with reference to the belief in the miraculous translation of the Holy House, and in that same attitude, we are assured, did he continue to the end.2 It is true, indeed, that his biographer has thought well to append to the letters above quoted a note to the effect that when they were written the “recent criticism as to the history of the Holy House was unknown.” Many, however, we feel sure, will agree with us in thinking that, in thus following the Catholic instinct, which he had imbibed so strongly with the faith, and in quietly accepting the pronouncements of the pontiffs, Newman was really following much safer guidance than any that the modern criticism could have offered. Though strongly opposed to exaggerated ways of speaking on the subject, it was the cardinal’s belief, as his same biographer admits, “that the pietas fidei should prompt to internal submission beyond the sphere covered by strictly infallible decisions”; and it must indeed be evident that our belief in God’s guidance of the Holy See cannot be restricted simply to occasions as comparatively rare as those indicated in the Vatican decree. When, therefore, in a case such as that before us we find pontiff after pontiff encouraging in every way the belief in the miraculous translation — whilst the same belief, moreover, has been rapturously adopted by a host of saints, including even doctors of the Church — it seems impossible to think that an error could have been allowed by God to receive such authoritative sanction. Since the above was written, the two pontiffs who have followed have each of them expressed their marked approval of the Loreto tradition. Under the first of these — the singularly enlightened Leo XIII — took place the sixth centenary of the arrival of the Holy House in Italy, and on occasion of it Pope Leo issued an encyclical, in which, without one word of hesitation, he reaffirmed the miraculous translation of it, inviting all the faithful to take part in the celebration of it, and grant­ing a Jubilee Indulgence to those who visited Loreto. In various ways also our late Holy Father Pope Pius X openly manifested his belief in the tradition, and his great displeasure at the attacks made recently upon it. It will be seen, I think, as we proceed, that these attacks have for their basis no fresh discovery disproving the tradition, and are rested, either upon grounds which are purely negative, such as the asserted absence of contemporary documents, or on unwarrantable accusations against those, by whom the tradition has been transmitted, of undue credulity, if not of actual imposture. Disregarding, however, these objections for the moment, let us first see what it is that is now shown to the pilgrim to Loreto; and what is the story of the Holy House and its miraculous translation, which has been handed down by its historians. “On a hillside, on the east coast of Italy, at a distance of about three miles from the sea, and eighteen miles south of Ancona, stands the city of Loreto. On the summit of the hill, towering far above the surrounding buildings, rises the magnificent cathedral church with its great dome and campanile. Unlike any other church, it seems to have something of the nature of a castle, owing to the fortifications with which it is provided, in order to repel the attacks of pirates, who might seek to plunder the sanctuary which the church contains. From its great height and from its position it may be seen, and the music of its bells is often heard, at a considerable distance out at sea. “On entering the church, there is seen beneath the dome a singular rectangular edifice, of no great height, constructed apparently of white marble, and richly adorned with statues and sculpture. On entering this building, the contrast between the poverty of the interior — at least as far as the walls are concerned — and the richness of the marble exterior is most astonishing. The walls, as seen from the interior, are the plain, rough walls of a cottage, and evidently of great antiquity. Towards the eastern end of the house, but at some little distance from the east wall, stands an altar, with an altar-screen of pillars and arches, which divides the house into two unequal parts. Behind the altar, in a niche in the east wall, is an image of our Lady and Child. It is said to be of olive wood, and partly from the nature of the wood, and partly from age, and from the constant smoke of the lamps, which are ever burning before it, it has become perfectly black. Both the Virgin and Child wear on their heads precious crowns of gold, and the figure is clothed in a rich robe, adorned with brilliants and jewels. This is the famous image of our Lady of Loreto. “On all sides of the house are suspended silver lamps, which are continually burning; and the contrast between the richness of these lamps, and the roughness and poverty of the walls, is as striking as that already spoken of between the interior and the magnificent marble exterior. “The peculiar hush and stillness, broken only by the occasional clinking of a rosary, which is so characteristic of an Italian sanctuary, may be especially observed here. Yet the house is usually full of people on their knees praying to the Madonna, and as they leave they may generally be seen affectionately kissing the ancient walls. There is something in the aspect of the building which of itself moves one to devotion; and this effect is intensified when the mind dwells upon the various mysteries of which these walls have been the witnesses. To this description of the Holy House by Father Hutchison it will be convenient here to add a translation of the inscription, which, for the instruction of the pilgrims, was engraved by order of Pope Clement VIII upon the eastern end of the marble wall which encases the Holy House. Placed there by the pontiff, as it was, expressly to inform the pilgrim of the facts, it is a clear and authoritative proof of the Holy See’s acceptance of the miracle of the translation. “Christian traveller, whom piety or vow has conducted hither, thou beholdest the holy Loreto House, renowned throughout the world for its divine mysteries and glorious miracles. Within the Holy House itself a briefer inscription, set in letters of gold upon the reredos of the altar, and placed there, it seems, by authority of Pope Clement VII, by whom the altar was moved into its present position, again reminds the pilgrim of the great mystery accomplished within those very walls: Hic Verbum Caro Factum Est Et Habitavit In Nobis. We must now endeavour to trace the history of the Holy House from the time when it was the habitation of the Holy Family at Nazareth to its miraculous translation to Loreto.